In the early 1980s, Caterpillar, Inc. lost one million dollars per day for three consecutive years. Its continuing existence came into question. Today, "CAT" is the world's most profitable manufacturer of construction and mining equipment and large engines. The now legendary global company made numerous well-calculated, though risky decisions for three consecutive decades--in the process scaling to heights unimaginable to even the finest business enterprises. How did they do it? The Caterpillar Way. The Caterpillar Way provides essential management lessons in powerful behind-the-scenes stories. You'll learn how the Caterpillar leaders responded quickly to changing markets, allocated capital efficiently throughout the firm, and nourished a cultish team spirit that wins. Innovative leaders make game-changing decisions. If any company is built to last, it's Caterpillar, Inc. With its trademark yellow trucks, cranes, machinery and engines, this home-grown manufacturer has survived more than its share of ups and downs to become the #1 industry leader of construction equipment in the world. 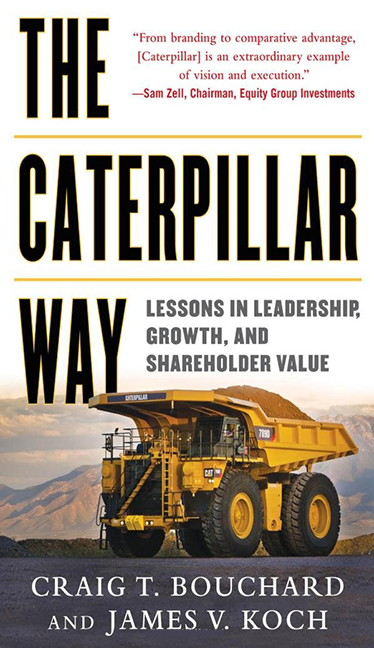 The Caterpillar Way reveals, for the first time, the remarkable inside story, written with full access to the way CAT runs its business, from bottom to top.